A living annuity (as opposed to a life annuity) can be (but is not always) an appropriate form of pension. As with any financial instrument it carries both risks and opportunities. Take advice, and make sure this is right for you before you decide. 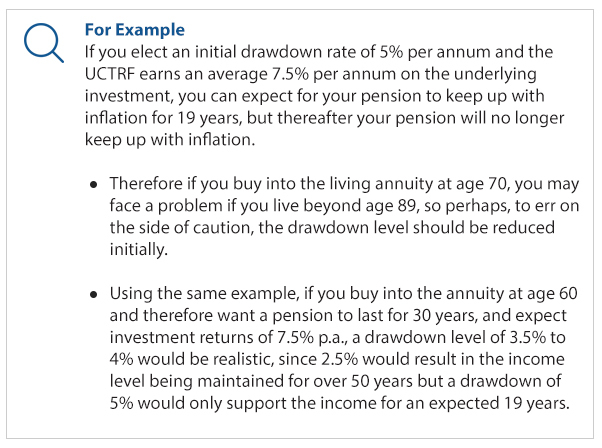 Consider the advantages of a UCTRF living annuity before you decide. What is a living annuity? This works somewhat like a bank account. You decide where the money is to be invested, and how much of this money you want to take as a pension in each year (minimum 2.5% and maximum 17.5% of the capital value). If you take too much out too quickly or the investment markets have poor performance or you live for longer than you thought you would, the “account” may decrease to such an extent that the income provided is meaningless. Living annuities are very flexible products and offer many attractions to the sophisticated investor. They do, however, have some significant challenges. You control amount of pension which you take – so you can adjust it to changing needs. You may take too much pension and end up with too little money to last until your death. You have full control and make active decisions. You have full control over where the money is invested and pension amount – will you be able to make sound decisions when you are older? You gain fully from good investment performance. You lose fully from poor investment performance. When you die, the remainder of the “account” is paid to your dependants or nominees. You may live longer than expected, ending up with too little money to last until your death. You can exit and buy a Life Annuity later. You can transfer your Living Annuity to another provider. 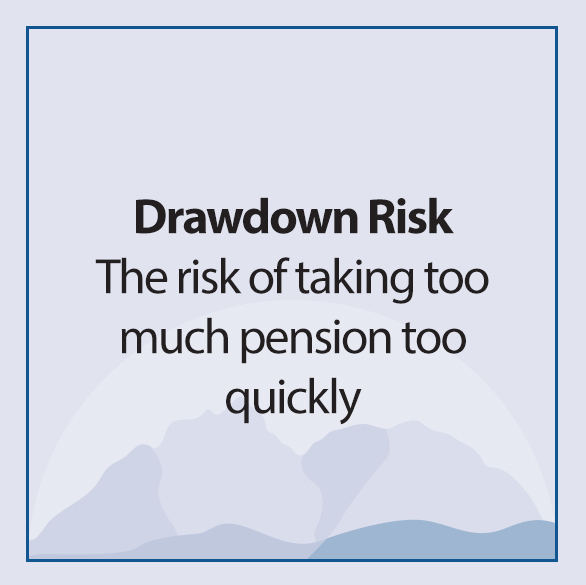 Drawing too much, or poor investment performance, may result in a decreasing pension. you need to leave something for your estate because your children will depend on this for their survival if you die, even if this happens many years in the future. In summary, with a Living Annuity, you make the decisions (around where the money is invested and how much annual pension you take), have the most flexibility and have the least guarantee that your pension will last until your death. 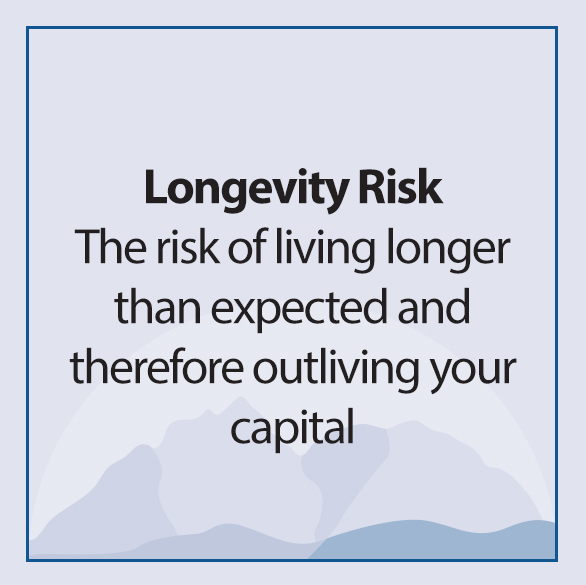 You bear the investment risk and the risk of living too long! It is your responsibility (in consultation with the financial adviser) to ensure that the income level selected is at a level that will be sustainable for a lifetime. The income drawdown relative to the investment return on the capital to achieve this, needs to be carefully managed. Speaking to a competent financial advisor is invaluable in helping you to decide whether a Living Annuity is the right choice for you, and if so, to help you to manage the risks involved. Apart from explaining both the advantages and the risks of a Living Annuity, a financial adviser must explain and compare these advantages and risks against conventional annuities, where a long-term insurer carries the full investment risk and the risk of the annuitant living longer than expected. 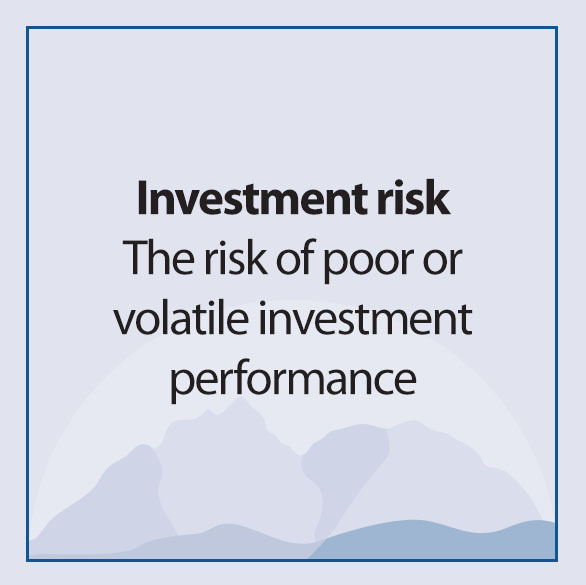 Investment risk – the risk of poor or volatile investment performance. As a Living Annuitant, you will have the responsibility for choosing the amount of pension or drawdown each year (within the minimum of 2.5% and a maximum of 17.5% of the capital value per year). The temptation may exist to draw a too high percentage. A high drawdown will very quickly erode the capital base, and will result in an inadequate pension within the space of a few years. As a rough rule of thumb an annual drawdown rate above 6% will probably result in great hardship in later years. 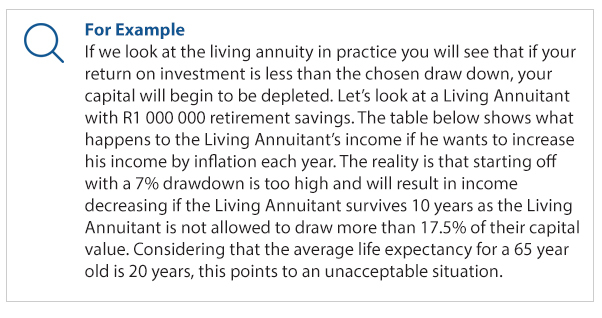 Realistically the maximum drawdown that should be taken on a living annuity is 4% which translates to a monthly income of R3 333 per R1 million rand. The living annuity is therefore typically suitable for the domain of the wealthy individual who has overfunded for his/her retirement. Many people have an inaccurate view of how much longer they will live once they retire – in fact usually people underestimate how long they are going to live! The following table shows, how long, on average a male and female are expected to live if they retire at different ages. The above figures may well understate the position, because life expectancy of people is increasing and living into one’s 90’s is now common. So you must make sure that when you are planning your finances you make adequate provision for how long you are actually likely to live. If the returns are too low relative to your pension taken, this will result in the capital value of your Living Annuity account decreasing. This may prompt you to choose a more aggressive investment portfolio in the search for higher expected return. Unfortunately, portfolios with a higher expected return usually are accompanied by higher volatility, which can mean that in some years, the same percentage of capital (drawdown chosen) will mean a much higher or lower pension in that particular year relative to inflation. It is thus very important to balance the need for high returns with the need for stable market values. A drawdown is the percentage of the remaining capital value that the Living Annuitant chooses to receive as income for the year. You must choose your drawdown or pension every year. The pension can be paid to you monthly, quarterly, biannually or annually. The drawdown must be between 2.5% and 17.5% of the remaining capital value. 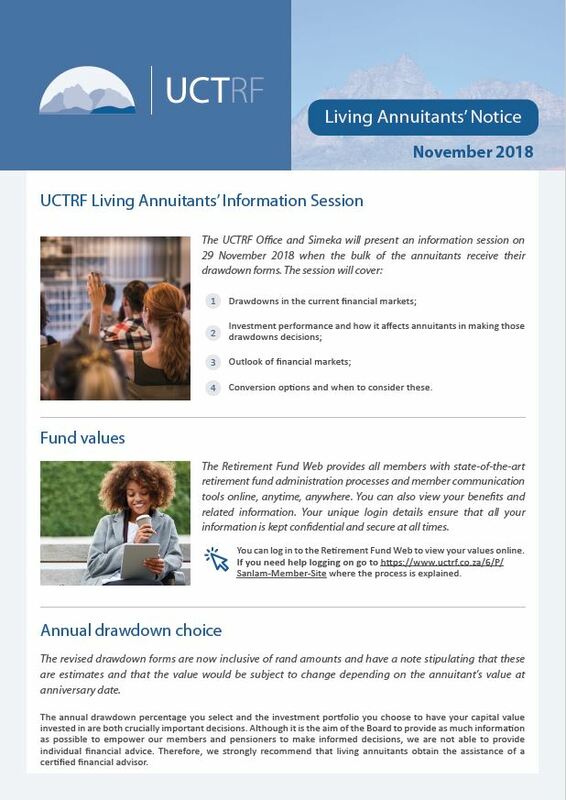 The UCTRF's administrator will send your Annual Income Change form to you for completion at outset, and then annually within two to three months of your annuity anniversary date. This form contains various drawdown percentages which are designed to guide you as to what level of drawdown would be reasonable at your age under various scenarios. Please note that this is guidance only and does not represent any guarantees. In general, it is always better to start on the lowest possible drawdown level that the you can afford, since this will allow for less chance of the capital being eroded quickly, more growth and the likelihood of being able to afford higher drawdown levels later, when you may need more (e.g. for medical costs). Please complete and return this form to the Administrator by the due date to ensure the continuous payment of your pension. In addition, some published information is available to guide you in this choice. This is shown below. The table below, which shows the number of years before the income will start to reduce, can be used as a guide (ASISA standard on living annuities, updated March 2018). The table assumes that the drawdown percentage income selected will be adjusted over time to maintain roughly the same amount of real income after inflation (in this case using a rate of 6.0% per annum.) Once the number of years in the table has been reached, the income will start to diminish rapidly in subsequent years. When using the table, the full financial situation should be taken into account, with all sources of income. It is an indicative guideline to assist in making informed decisions about a living annuity only. As a Living Annuitant you have exactly the same Portfolio options to choose from as you had as an active member/ deferred pensioner of the UCTRF, i.e. How do I choose an investment portfolio? Living Annuitants have different needs and requirements when it comes to investments and the risks they, as pensioners, can accommodate. Each Portfolio in the UCTRF has its own unique Risk Profile and you choose the portfolio that is most suitable for you and with a Risk Profile that closely matches your needs and expectations. How important are historic returns when choosing an investment portfolio? Portfolios invested in shares will usually have good returns in some years and poor returns in other years. But over a twenty-year period, their chance of achieving good returns is high. It is therefore not a good idea to look at short-term historic returns when deciding on which portfolio to choose. Typically, members switch out of poor performing portfolios when markets fall and are not there to reap the good returns when these portfolios eventually recover. You may now switch portfolios at any time. You will get one free switch in each period between 1 July and 30 June and additional switches in this 12 month period will incur the applicable administration fee at the time, which will be debited to your fund credit. If you wish to switch your investment portfolio, you can do this through Sanlam’s Retirement Fund Web. If you need any assistance, please contact the UCTRF Office. Can I transfer my Living Annuity with the UCTRF to another insurer? You may use the balance in your Living Annuity Account to purchase either a Living Annuity or a Life Annuity from another Insurer. Please note that a Market Value Adjustment may apply if you are invested in the Smoothed Bonus Portfolio (Portfolio B) and wish to exit this portfolio. Can I withdraw the capital from my Living Annuity? If the living annuity balance falls below the amount prescribed by the Commissioner, at that time, the pensioner or Beneficiary as the case may be, may commute the amount and be paid this in cash. What happens to my living annuity in the event of my death? The remaining capital can continue to be paid to your Beneficiary or Beneficiaries as it was paid to you, or it can be taken as any other pension that may be purchased, or your Beneficiaries can elect to take a lump sum payment. The individuals to whom the capital balance will be allocated, as well as the actual allocation, is determined by the Board in terms of Section 37C of the Pension Funds Act. if there are no dependants or nominees, to your estate. 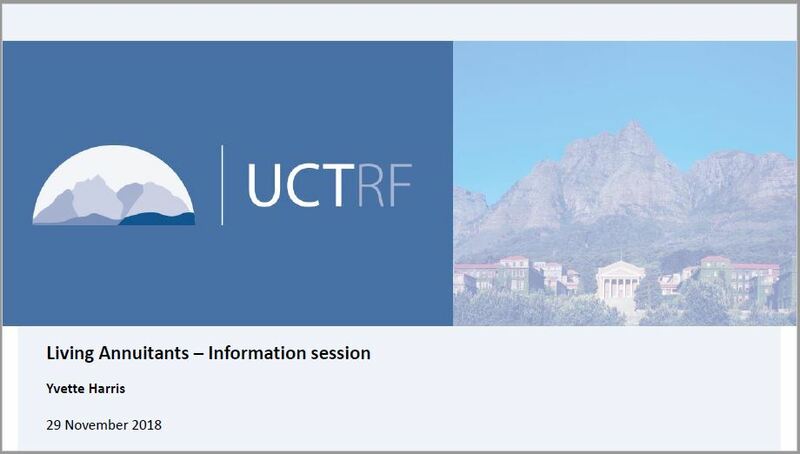 Although the Board will consider the members’ wishes in terms of their nomination of Beneficiary form, the final decision of who will receive the UCTRF death benefits rests with the Board, who must abide by the UCTRF Rules as well as Section 37C of the Pension Funds Act. You can update your Beneficiary nominations online. Click here to find out how. If you don’t want to make online Beneficiary nominations changes, you can complete the HR151 and HR155 and send the originals to the UCTRF Office. If you would like to motivate your recommendations, include a motivation with your nomination. Please draft your motivation on the assumption that it will be acted on in the next twelve months. There is a once-off set-up fee charged by the UCTRF when a new Living Annuity pension commences. This is currently R446 (excluding VAT), and will be deducted from the retiring member’s accumulated credit at the time that the Living Annuity is set up. Monthly amounts are deducted from the Living Annuitant’s account to cover the expenses of maintaining the account and making income payments to the Living Annuitant. Currently these charges are R106 per month (excluding VAT)for administration, and R11 per month (excluding VAT) for annuity payments. If you want to switch investment portfolios, you will get one free switch in each period between 1 July and 30 June. Additional switches in this period will incur the applicable administration fee at the time (currently R431 (excluding VAT)), which will be debited to your fund credit. You do not have to switch, and most members do not wish to do so, as retirement savings should focus on a long-term investment strategy. Portfolio A (Income Fund) – the investment fee is 0.10% p.a. plus VAT. Portfolio B (Smoothed Bonus Fund) – management fees of 0.25% p.a. are deducted from the gross bonuses declared each month by the insurance company (MMI Life) to cover the cost of product management. Various fees and charges are deducted from the value of the underlying assets before bonuses are declared – these comprise fixed fees plus any performance fees payable, paid by MMI to the underlying investment managers, and a capital charge of 1% p.a. to cover the cost of the guaranteed provided by MMI. The product also invests in certain net-priced investment vehicles (e.g. offshore funds) – the fees for these are also recovered directly from the assets underlying these funds. It is reasonable to assume that the combined total of the management and investment fees plus the capital charge is some 1.75% p.a. plus some performance fees. Portfolio C (Balanced Fund) – the assets underlying Portfolio C are invested with a number of different fund managers, so the total investment management fee is a weighted average of the amounts paid to each manager, and will vary from time to time as the mix of managers changes. In a few cases the manager may at times receive performance fees for good investment performance, which will also cause the total fees to vary over time. The base fees are currently estimated to be some 0.43% p.a. plus VAT, and it is likely that the total fees will average some 0.60% p.a. plus VAT over the longer term if performance fees are also included. Portfolio D (Shari’ah Fund) – this is invested in a multi-manager portfolio, for which there is a fee of 0.30% p.a. for product management and administration, plus fees paid to the underlying investment managers. However, the total, combined fees will not exceed 0.90% p.a. plus VAT. You may need to seek financial advice before making an investment decision. In the case of a Life Annuity, you pay over an amount to an insurer in return for a pension. The amount of initial pension that you will receive is set by the insurer (as set out in quotations), and the pension is guaranteed to be paid for the rest of your life. Pension is guaranteed to be paid for life, and in accordance with your wishes as regards guarantee term and provision for your spouse. No flexibility in level of pension, once the pension has been set up. You can specify a guarantee term of (e.g.) 5 years, which means that the pension is guaranteed to be payable to your dependants even if you and your spouse both die before the end of the guarantee term. If you and your spouse both die after the “guarantee term” has ended, no benefits are available for your dependants or estate. You don’t have to make any management decisions except at the point of retirement. At this point you decide the “guarantee” No possibility of exit. You want a guarantee that your pension will be paid for the rest of your life and not run out. You are in good health and expect to live longer than most people of your age. Your children are not financially dependent on your estate, or will be financially independent within the next few years. You don’t want the responsibility of making decisions about your pension (investment and amount) continually until you die (possibly at the age of 90+). You pay over an amount to an insurer in return for a pension (the initial amount is set by the insurer at the time of purchase) which will increase with inflation every year and will be paid for the rest of your life. You pay over an amount to an insurer in return for a pension (the initial amount is set by the insurer) which will increase as determined by the insurer every year based on investment performance and will be payable for life. Pension increases are guaranteed to keep up with inflation and are not linked to investment performance. Pension increases are determined by the insurer depending on investment performance – these could be 0% in poor years, or higher than inflation in good years. Lower initial pension. Higher initial pension. - You want certainty around the amount of pension which you will receive, be protected against inflation and know that this will be paid for as long as you live. - Future investment performance is poor. - This is your only source of income in retirement. - You are willing to tolerate the possibility of lower than inflation pension increases in return for the possibility of higher than inflation pension increases. You want a pension that will be paid for as long as you live. - Future investment performance is good. - You have alternative inflation linked income in retirement. Q: Are you independent or tied to an insurer? A: An advisor tied to a particular insurer will only be able to sell that company’s products, while an independent financial advisor can advise on and sell products from any provider across the market. This allows you to compare a variety of insurance products and decide on the one that best suits your needs. A. When choosing a financial advisor, it helps to understand how your advisor gets paid, because those who secure commissions may apply a different methodology to advisors who work on a fee basis. Commission only: Some advisors only receive commissions from product providers for providing financial services and selling products, such as investments, insurance products and healthcare funding products. Commission and fees: Commission and fee advisors may charge you a fee for developing a financial plan for you, and then receive commission when they sell you insurance and investment products recommended in your financial plan. Fee-only: Fee-only financial advisors usually provide advice or ongoing management of your financial plan. You may find that you need regular advice from your advisor for your business dealings, or you may have a complex financial portfolio that needs regular input, but does not necessarily involve the sale of a product which earns the advisor any commission. However, there is enormous value in your advisor’s time and advice given, and in these scenarios a fee-based system may work best. Discuss the benefits and disadvantages of all payment methods with your advisor and establish upfront the basis upon which you will work with your advisor. Q. What qualifications do you have? A. Ask to see proof of your financial advisor’s credentials. The insurance industry has formalised qualifications for financial advisors, and you should ensure that your advisor is Financial Advisory and Intermediary Services (FAIS)-licensed. If an advisor is working under supervision it means that they still need to qualify by passing their regulatory exams and will be working under the guidance of a qualified individual. FAIS ensures that there is significantly less room for error and malpractice. As a consumer, you are now better protected as emphasis has been placed on putting client interests first, and ensuring the quality of service and advice. Q. How do you determine my specific needs? A. A good financial advisor will look at your needs and potential risks over the long term — assessing everything from your future goals to life cover, critical illness and disability, income protection, retirement, savings, investing and healthcare funding. They should also look at how your last will and testament interacts with your financial plan. And remember, just like there is no single product provider that can offer all of the necessary covers in one neat, well-organised and appropriately scoped package, your advisor may also call on specialists to look at specific areas of your financial plan. For example, he may call in a specialist in trusts, or a legal expert to look at your will, or a tax expert to look at the tax implications of your estate. A good advisor will always support the need to bring in specialists, especially with complex portfolios, to ensure that all your bases are covered and all consequences considered. Q. How will you communicate with me and how often? Staying in touch with your financial advisor is critical to managing your portfolio and developing their knowledge and understanding of your needs. The regularity with which you meet will depend on your goals. These should be agreed upon with your broker at the outset. If your objective is simply to implement a simple risk insurance solution, such as bond cover and a long-term retirement annuity to supplement your company pension scheme, then an annual update may be adequate. If you are more goal-driven in terms of your finances — perhaps with aspirations to retire young and wealthy, or to leave your job within five years to start your own business — your needs will be very different. It is also important to consider “trigger events” that may necessitate action or advice; such as retrenchment, divorce, or additions to the family. Any change in circumstance can alter your risk and should be evaluated as part of your financial plan and strategy. Q. What claims service do you offer, and what has your claims experience been with different providers? A. Look for a financial advisor who understands the importance of issues such as service delivery and claims settlement — purchasing an insurance policy should be about more than finding the cheapest rates. Your advisor has a moral obligation to act in your best interests and manage all of your claims on your behalf, ensuring that the process runs smoothly. Find out about their experience with difficult claims or cover disputes, and look at any claims information they may have about different insurers. It’s important to know that the insurer you select has a solid track record when it comes to claims settlement and an ethos of acting in their client’s best interests. Q. May I contact some of your existing clients for a reference? A. Word of mouth is the best way of establishing your insurance broker's reputation for service. It’s also worth looking at the Financial Planning Institute (FPI)’s website (http://www.fpi.co.za/)for background information and to establish whether your advisor is a member of the FPI. The role of the financial advisor has become increasingly important as the global economy undergoes fundamental shifts. Now, more than ever, it is vital to know that the person you entrust with your financial future has your best interests at heart.